Tomorrow (Friday ) DNG Maxwell Heaslip & Leonard will host the third of its 2015 auctions, and aims to continue the huge success it has enjoyed at its auctions this year. The team boast a 94 per cent sales rate at auction, the highest in the country since the beginning of 2015. Tomorrow's auction in the Raddison Blu Hotel will feature a mix of property with something to suit all spectrums of the market, and all with very attractive guide prices. Heading up the auction team, James Heaslip is looking forward to Friday and to the sense of occasion and anticipation associated with auction day. “On the back of our April auctions, and the unprecedented success we’ve had, we are looking forward to keeping the momentum going and keep the interest levels high for our June 5 auction," he said. "In this particular auction we have just 12 lots but its certainly one of the most varied and eclectic mixes of lots we’ve offered to the floor in some time. We have properties which will appeal to the first time buyer looking to get their feet on the the property ladder, properties which will attract investors seeking value for money with good rental yields, and properties which will entice those looking for a spacious family home away from the city limits." This three bedroom terraced house is in a much sought after location in Shantalla, within walking distance to NUIG, UHG and the city centre. In good condition, the house has oil fired central heating, double glazed windows, and a large private south facing rear garden. Residents are entitled to on-street parking. In a great location, this wonderful property will appeal to investors looking for a prime rental location and owner occupiers seeking a city home close to all amenities. Guide price is €155,000. Solicitor with carriage of sale is Grainne Finn, Ronan Daly Jermyn solicitors, Long Walk, Galway, phone 091 594777. This spacious three bedroom semidetached family home in a quiet cul-de-sac in a much sought after development in Knocknacarra, is being offered to the market with almost 1,000sq ft of living space. This property is in need of some decorative works but has huge potential. The house boasts a west facing rear garden which is not overlooked and has private off street parking. Monalee Heights is just a 10 minute drive from Galway city centre and is close to all amenities. Guide price is €200,000. Solicitor with carriage of sale is Alan Casey, Elaine P Casey & Associates solicitors, Thomand House, High Street, Ennis, Co Clare, phone 065 6820001. A second floor two bedroom apartment located on the east side of Galway city, this home is well designed and well presented and offers an excellent opportunity to acquire an investment property in a well maintained, fully managed, complex. The property is included in a pooled rental system and is located within close proximity of GMIT, Galway Technology Park, and all necessary amenities. Guide price is €75,000. Solicitor with the carriage of sale is Helena McGrath, McDermott & Allen, Francis Street, Galway, phone 091 567071. Six units, Numbers 14, 20, 41, 43, 50, and 56, located at Palmerstown Court, Mungret Street, Limerick city, are being offered for sale in one lot. This development is in a city centre location and adjacent to all amenities. This is an excellent opportunity to acquire investment income, with the properties currently generating €18,000 a year after costs. These six apartments are part of a pooled rent complex fully managed. Guide price is €160,000. Solicitor with carriage of sale is Michael Ryan, MG Ryan & Co solicitors, Abbeygate House, 34/36 Abbeygate Street Upper, Galway, phone 091 564011. This is a mid-terrace two storey residence on the main street of Borrisokane, on the road between Portumna and Nenagh. The property is in need of major renovation. On a site of c0.35 acre, the main building extends to approximately 1,200sq ft with private access from the main street to a large rear garden which includes outbuildings extending to c2,200sq ft. This is an opportunity to acquire a well priced renovation project in a busy town in Co Tipperary. Guide price is €20,000. Solicitor with carriage of sale is Justin Murphy, Lyons Dermody solicitors, 43 Parnell Square West, Dublin 1, phone (01 ) 873 3000. A spacious two storey property in a picturesque location in Corrandulla, Co Galway. Built on a large site of almost 0.76 acres, the house has almost 2,200sq ft of space and, although in need of some minor decorative work, this fine family home is more or less ready for immediate occupation. It is being sold with the benefit of a wood pellet central heating system, wood floors throughout, and a high standard of finish. It is located just five minutes drive from Corrandulla and only 20 minutes from Galway city. Guide price is €200,000. Solicitor with carriage of sale is Emma Scott, Baily Homan Smyth McVeigh solicitors, 7 Harcourt Terrace, Dublin 2, phone (01 ) 440 8300. This large, detached, incomplete residence in the town land of Cashlaundarragh in Monivea stands on a site of c0.67 acre. The house comprises approximately 2,100sq ft and is plastered and ready for second fixing. Set in a scenic location, the house on completion will make a very attractive home and is just 40 minutes from Galway city. This is an ideal opportunity for the new owners put their own finish to a bright and spacious family home. Guide price is €115,000. Solicitor with carriage of sale is Emma Scott, Baily Homan Smyth McVeigh solicitors, 7 Harcourt Terrace, Dublin 2, phone (01 ) 440 8300. This is a beautifully presented three bedroom detached bungalow residence in the ever popular area of Renmore on the outskirts of Galway city centre. Recently completely renovated, this stunning property is finished to the highest standards and is in turnkey condition. High graded laminated wood floors, extensive tiling, top quality carpets, curtains, fixtures and fittings are among the features included in the sale. Within a short walk of GMIT, Bon Secours Hospital, and all amenities, this outstanding home is an ideal purchase in one of the city’s most sought after locations. Guide price is €255,000. Solicitor with carriage of sale is John Glynn, Patrick Hogan & Co solicitors, Dunlo Street, Ballinasloe, Co Galway, phone 090 9642110. 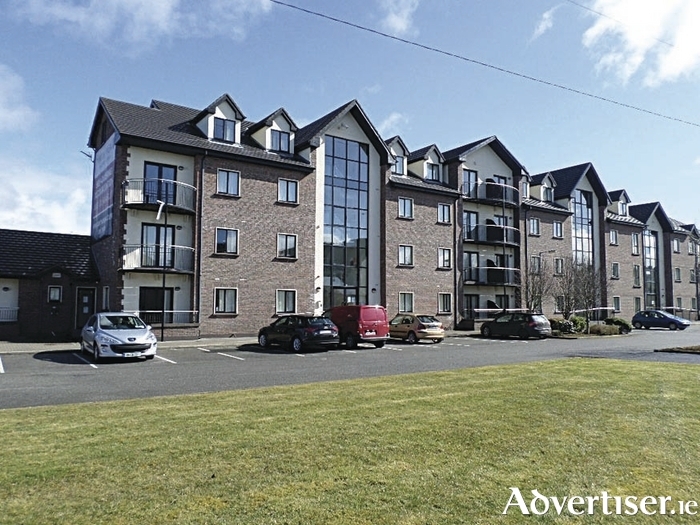 This large four bedroom first floor apartment in a modern complex on the east side of Galway city, comprising almost 100sq m of living space, is part of a fully managed complex with pooled rents generating a net income in the region of €11,000pa. In excellent condition, the unit has all mod cons and is within walking distance of GMIT and is next door to the Clayton Hotel. Guide price is €110,000. Solicitor with carriage of sale is Emma Scott, Baily Homan Smyth McVeigh solicitors, 7 Harcourt Terrace, Dublin 2, phone (01 ) 440 8300. Number 136 Fearann Ri is located in the popular suburb of Doughiska on the eastern outskirts of Galway city. This four bedroom detached property is in reasonable condition and comprises a sitting room, kitchen/dining room, wc and whb on the ground floor, with four bedrooms, master en suite, and main bathroom on the first floor. The house has gas fired central heating and is timber framed construction. This is an excellent opportunity to acquire an attractive investment property or a spacious family home. Guide price is €100,000. Solicitor with carriage of sale is Ruth Sheridan, William Fry solicitors, Fitzwilliam House, Wilton Place, Dublin 2, phone 01 6395000. A outstanding superb three bedroom semidetached residence built by O’Malley Construction, this well presented property benefits from a host of attractive features including wood floors, extensive tiling, a modern fitted kitchen, a paved driveway to the front, and a beautiful rear garden which is not overlooked. This is a wonderful opportunity to acquire a perfect first time buyer’s home in a hugely sought after location. Guide price is €190,000. Solicitor with carriage of sale is Sinead Hennessy, Beauchamps solicitors, Riverside Two, Sir John Rogerson’s Quay, Dublin 2, phone 01 4180600. The auctions take place tomorrow in the Radisson Blu Hotel, Lough Atalia, at 3pm and can be viewed live online on dnggalway.ie For further information contact 091 565261. This is a beautifully presented three bedroom detached bungalow residence in the ever popular area of Renmore on the outskirts of Galway city centre. Recently completely renovated, this stunning property is finished to the highest standards and is in turnkey condition. High graded laminated wood floors, extensive tiling, top quality carpets, curtains, fixtures and fittings are among the features included in the sale. Within a short walk of GMIT, Bon Secours Hospital, and all amenities, this outstanding home is an ideal purchase in one of the city's most sought after locations. Guide price is €255,000. Solicitor with carriage of sale is John Glynn, Patrick Hogan & Co solicitors, Dunlo Street, Ballinasloe, Co Galway, phone 090 9642110. A outstanding superb three bedroom semidetached residence built by O'Malley Construction, this well presented property benefits from a host of attractive features including wood floors, extensive tiling, a modern fitted kitchen, a paved driveway to the front, and a beautiful rear garden which is not overlooked. This is a wonderful opportunity to acquire a perfect first time buyer's home in a hugely sought after location. Guide price is €190,000. Solicitor with carriage of sale is Sinead Hennessy, Beauchamps solicitors, Riverside Two, Sir John Rogerson’s Quay, Dublin 2, phone 01 4180600. The auctions take place tomorrow in the Radisson Blu Hotel, Lough Atalia, at 3pm and can be viewed live online on dnggalway.ie. For further information contact 091 565261.